Calcium and magnesium are very important in supporting the health of muscles, bones, teeth. Magnesium activates over 300 enzymes or more in the body and with calcium, is vital to nerve and muscle functions and pathways. Super Cal contains five essential oils including Idaho Blue Spruce and Copaiba! Rather use a Powder? Then check out MegaCal Calcium Magnesium Powder. Or a calcium-magnesium supplement without Vitamin D and K? Then you will want Super Cal Original Formula! Also check out Sulfurzyme Supplement which combines MSM, FOS and Ningxia wolfberries in a convenient powder form or BLM Supplement. Or OmegaGize which contains D3, essential oils and Omega 3 fish oils. This is an easy reference guide for Super Cal Plus Supplement. It will tell you how to use your oil blend and what to use it for. It will also provide you with some fun tips and testimonials! Want to Purchase Super Cal Plus Calcium Magnesium Supplement? 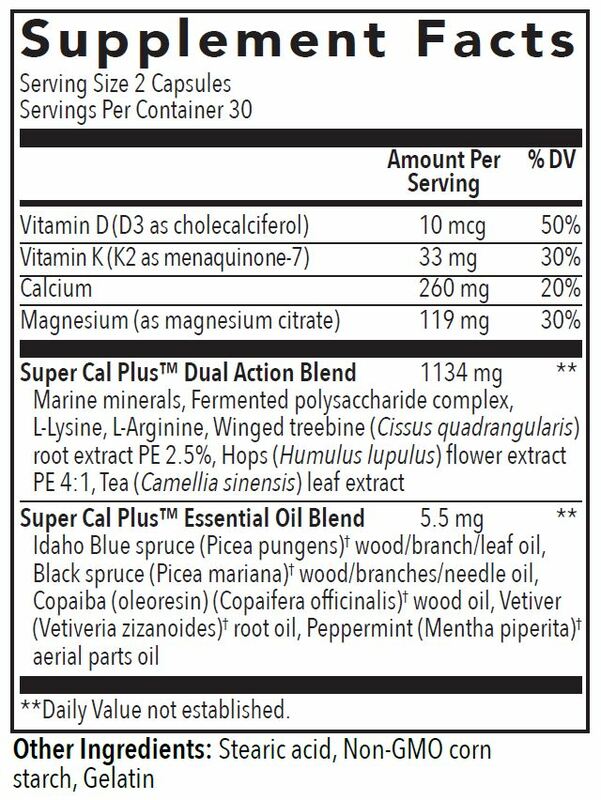 What is in Super Cal Plus Supplement? Super Cal combines natural ingredients as well as essential oils. Vetiver Essential Oil (Vetiveria zizanioides) brings you back to nature. It is a grounding oil and is one of the oils that is highest in sesquiterpenes, Vetiver was studied by Dr. Terry Friedmann for improving children's behavior. Vetiver may help when coping with stress and to recover from emotional upheaval and shock*. 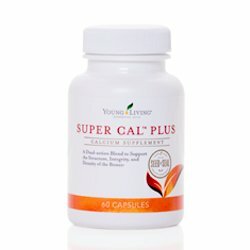 What are the Documented Uses for Super Cal Plus Supplement? Support healthy bones, teeth, and muscles*; promote healthy nerve conduction, muscle contraction, and cellular function*. May reduce the risk of osteoporosis with healthy lifestyle*. How do I use Super Cal Plus Calcium Magnesium Supplement? Take 2 capsules daily with food or as needed. Can this Supplement be used for Animals? Yes, hasn’t been used extensively in animals at this time. What are the Safety Precautions? If pregnant or under a doctor's care, consult your physician.